Nestled in the Potohar region of Pakistan, in the village of Mallho in District Attock, Mr. Wasiq Khan along with his team start the process of harvest in his grape vineyard before the July monsoon rains. Acres of grape vines, heavy with King Ruby and Flameless Seed grapes are sprawled across the trellises. Mr. Wasiq Khan, the proud owner of this vineyard has already sold 75% of his produce for a hefty sum of Pak Rs.2.125 million. This was not the case 2 years ago. After years of growing potato and wheat, Mr. Khan decided to start grape farming in 2010. After planting the grapes saplings, Mr. Khan tended to it for 2 years till the vineyard reached the fruiting stage. The first fruit harvest ended with no profit as most of the fruit was of poor quality. 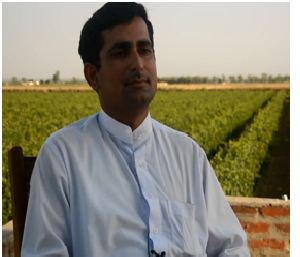 In 2013, through Agribusiness Support Fund, Mr. Khan received training on Vineyard management. Through the project he learnt pre- and post-harvest management techniques such as trellising, canopy management, spur pruning, picking and packaging. 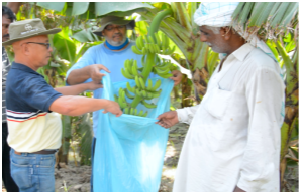 Through these practical, field-based trainings and technical support, Mr. Khan’s vineyard blossomed and in 2014, even before harvest, buyers had purchased 75% of his farms produce. “Through Agribusiness Support Fund (ASF), we have received technical support and trainings that have been critical in producing a 100% turnaround profit for my farm. I hope we can continue receiving their support in the future as we want to be able to produce grapes that are of export quality. Right now we are not very far from that”. Mr. Wasiq Khan is now proudly showing his grapes to buyers due to their superior quality and is also earning money by selling saplings from his vineyard.